Rent The Musical UK Tour, Curve Theatre, Leicester. Rent is without a doubt my favourite musical of all time. Having listened to the soundtrack non stop during my college days, it continues to pull at my heart strings with it's emotive account of Bohemian life in modern East Village, New York around 1989-1990. Celebrating the 20th anniversary of Jonathan Larson's much loved musical is a passionate rock musical version loosely based on Puccini's opera La Boheme. This highly anticipated new UK tour production from Bruce Guthrie has been given a fresh makeover resulting in a production that seizes, refreshes and executes well a musical that comes with high expectations. A cast of emerging or established talent provided a fresh take on a well established musical it's clear why they've received standing ovation over and over. The score captures the heart and spirit of a generation of struggling artists, addicts, and impoverished young people living in the shadows of AIDS, battling the coming way of gentrification. It's themes are strong throughout the performance so it'll be tough to fight back your emotions as you experience 525600 minutes in the the life of friends in a 2 hour performance. What brings me back to Rent every time is it's focus on different relationships intertwined into the one group of friends, every working collectively to hopefully enabling us to reflect on the relationships we share with others. 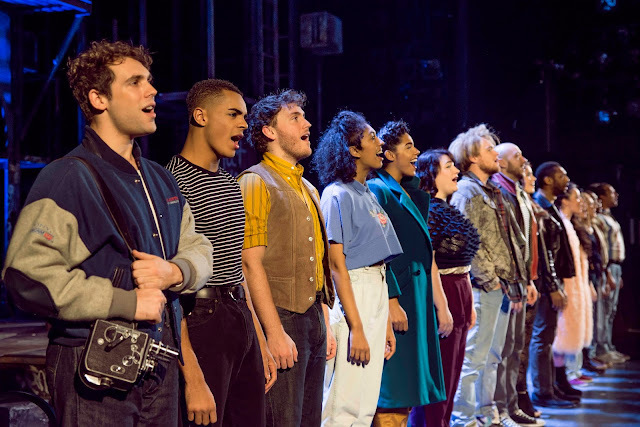 The introduction of Angel's character is a certain point when seeing the show that many Rent lovers await for, Layton Williams does not disappoint in his take on the very flamboyant but strong individual that Angel is. His own rendition and influence on the character is flawless, choreography by Lee Proud is captured with accuracy, determination and jaw-dropping technical skill that gives his character so much more than what I've known before. He's an absolute joy to watch and very passionate. His relationship with Collins, played by Ryan O'Gorman is something that sets the stage for the LGBT community as well as the audience. It's a poignant reflection of gay relationships being represented on stage that is acted with a genuine connection between both of the actors. Their relationship takes a strong hold in the attention of the entire auditorium and you can't help root for their happy ever after together. There isn't a dry eye in the house when Angel's character is seized by the evil AIDS virus and O'Gorman's soulful reprise of I'll Cover You fills the auditorium. The two leading men in the musical, Billy Cullum as Mark Cohen and Ross Hunter as Roger Davis will bring together these various relationships together, especially with Billy's take on Mark's role that is brilliant, even flaunting some of the comedy within the role that sometimes doesn't get recognised. There was big boots to fill in the roles of Maureen Johnson and Joanne Jefferson. Lucie Jones and Shanay Holmes are the latest actresses to create the feisty, vocal power and unpredictable relationship between the lovers. Their defined differences in personalities shines in their performance of Take Me Or Leave Me with a lot of comedy elements as well as plenty of attitude thrown in for good measure do! It definitely provided the vocal power needed to perfectly execute the lyrics. Jones's version of Over The Moon was every bit of bonkers and force that you'd expect from Maureen's character! Also big shout out to the choreographer Lee Proud who's movement repertoire in La Vie Boheme was everything and more I expected from the fast paced song, especially the hand gestures which were very well rehearsed. The song Seasons of Love is very much a song celebrating 525600 minutes of a year and as my favourite song from the musical I felt satisfied with how well it was produced. 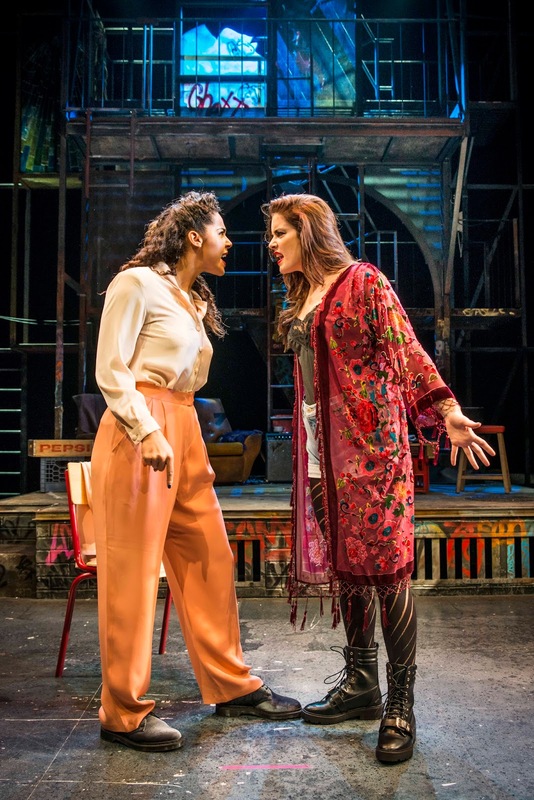 Rent is no doubt a come-back musical not to be missed, it's presentation of various relationships as well as sensitive subjects is well done. It perfectly captures a time in history that needs to be recognised, it's musical has also become the foundations for so many modern contemporary musicals that we see filtering through our theatres too. I'm a huge fan of 'Rent' and would never have thought that I'd want to see it changed in any way. This production is brave enough to try a few things that I don't believe have been done before in other versions and, rather than detracting from the show I love, it actually adds to the experience. Emotional, beautiful, moving and life affirming, this production of 'Rent' has it all. It's standing ovation by 90% of the sell out crowd on the night I was there was the very least it should have got.